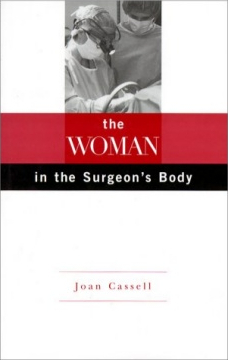 In this book, Dr. Joan Cassell, an anthropologist, reports her observations and interviews with 33 women surgeons in the United States. She had previously done research on general surgeons and sought to understand the role, characteristics, and potential burden of being a female who pursues surgery. In the early 1990s, Dr. Cassell spent several days observing each surgeon, her home life, her interactions with nurses and colleagues, and her operations. Following her period of shadowing, she conducted in-depth interviews. The first few chapters of the book delve into anthropological concepts and theory which are necessary to understand the framework of her study as well as how she interprets her observations. She spends quite a bit of time describing different theories on behavior, from biological determinists believing men and women are biologically engineered to have different strengths and weaknesses to social constructionists who view behavior as a result of interaction with the environment. She notes that neither theory is adequate to explain her observations of female surgeons, and so spends quite a bit of time describing the concept of "embodied identity." She uses this concept to explain how female surgeon behaviors are in fact different from their male counterparts, but often in ways of which the female surgeons themselves may not be aware. Certain behaviors, Cassell explains, are endowed with unconscious meaning as a result of a complex interplay of images, symbols, and cultural norms. To illustrate her point, she describes the different styles of compassionate behaviors a male and female pediatric surgeon display towards their patients. The female surgeon, Cassell observes, adopts motherly behaviors with her patient perhaps based on "embodied knowledge" of the symbols of female compassion in our culture. However, when asked, the female surgeon denied that differences in caring and compassion were associated with gender. Cassell uses this and other examples throughout her book to postulate that although male and female surgeons may both be compassionate, they express their compassion through different behaviors that are often unconsciously engendered. Although Cassell presents a fascinating take on male and female behaviors, one caveat we must also recognize is that Cassell’s observations may be filtered through her own interpretations and biases. The remainder of the book focuses on the narratives of the female surgeons she studied. We learn about the passion and commitment of these remarkable women, as well as many of the challenges they had to overcome. She describes the delicate balancing act of working long hours while also bearing the responsibility of child care and home life. Other challenges faced by these women include covert and overt sexism. Such examples included women being passed over for jobs, being paid less for the same position, or one male surgeon saying "Anybody but the girl! Give me a trained monkey—I'd rather have anybody but the girl!" As the numbers of women surgeons have grown, I like to think surgical training is no longer as hostile as it was for these women, but what is truly inspiring about the book is the resilience of the surgeons themselves. Their commitment to outstanding patient care in the face of adversity is a testament to their grit and compassion. Seeing the field of surgery through the eyes of an anthropologist reveals a different perspective on the evolution of surgery, and in particular, the role of women in surgery. I found this book to be inspiring, thoughtful, and provocative.